Vibracart Paypal has a powerful discount and coupon code system. This pages contains example buttons showing how Vibracart Paypal works with discounts and coupon codes in the default mode with a floating widget and popup cart. As well as the item discounts mentioned next to each button there is a cart wide discount setup of $5.00 for orders of $25 or over if coupon code PROMO1 is entered. The Paypal part is live so don't complete the transaction! Vibracart has many discount types that can be applied to the cart total or to individual items. Each discount type can be set to work only if a coupon code is entered too. Discount types include quantity discounts, step quantity discounts, buy one get one free etc. There are also discounts that can be applied when certain products are purchased together for example. Download the manual the read more about the types of discounts supported. Vibracart has several ways to apply and show discounts in the cart. 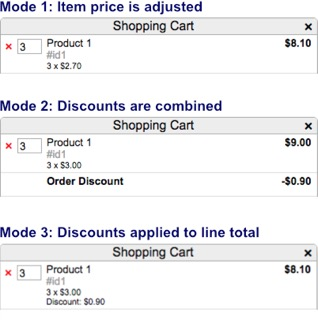 By default we apply discounts to the item price but there are options to combine item discounts with the total cart discount or to apply the discount to the item line total.The demo on this age uses the default mode which applies discounts to the item price. 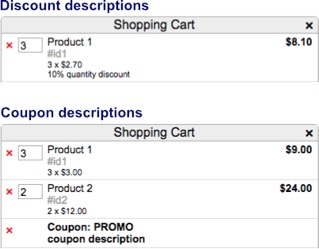 You can optionally apply labels to discounts and coupon codes which are displayed in the cart. Click the button below to add this product to the cart. We have a discount set up of 10% if you buy 3 or more of this product. Click the button below to add this product to the cart. We have a coupon setup (PROMO2) offering 15% discount if 2 or more are purchased. Click the button below to add this product to the cart. There is an item discount of 10% setup If you purchase this product combined with Product 4 and Product 5.